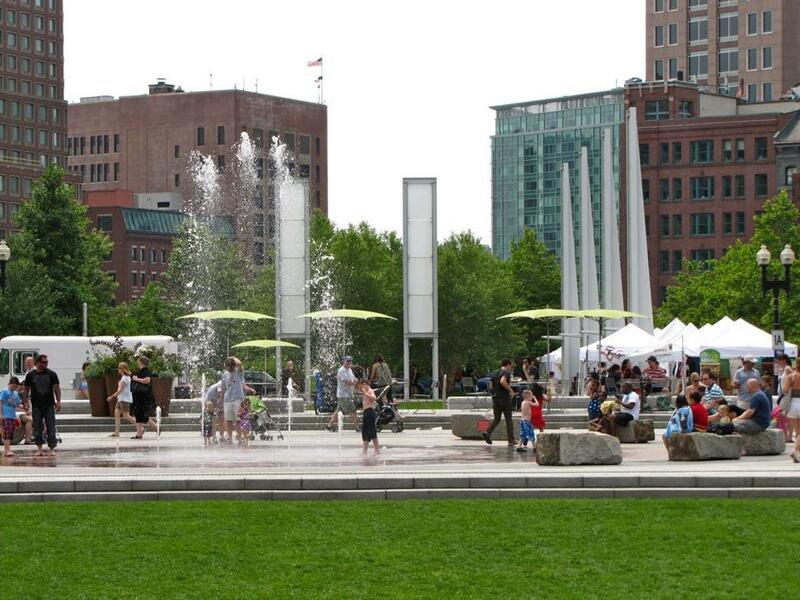 A fountain near the Greenway Open Market on the Rose Fitzgerald Kennedy Greenway. 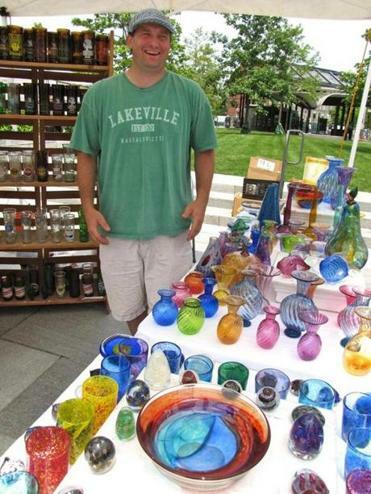 Gabriel LaFleur sells handblown glass vases and more. On the first sticky day of summer, Gabriel La-Fleur seems unfazed by the climbing temperature and humidity as he greets customers with a wide smile at his Angelic Glass display tent, part of the Greenway Open Market. Sunlight glints off his delicate and brightly colored handblown vases, decorative fish sculptures, and sturdy drinking glasses crafted from recycled beer and vodka bottles. The park he refers to is part of the Rose Fitzgerald Kennedy Greenway in downtown Boston, more than a mile-long series of parks, fountains, and gardens that is the legacy of the Big Dig, the more than 20-year project that relocated the elevated Interstate 93 to a tunnel beneath the city. On Saturdays from May to October, a section of the park between the New England Aquarium and Faneuil Hall becomes a market filled with area artists, crafters, independent designers, and food trucks. Some vendors participate every week, others once a month, so the selection is always evolving. Among the offerings you are apt to find jewelry, handbags, glass, honey, soap, textiles, candles, sunglasses, photographs, baby clothes, dog collars, silk-screened T-shirts, and boutique fashions. Lisa DeMio designs women’s accessories — handbags, totes, messenger bags, and more — and sews them all by hand in her home studio in southern New Hampshire. She travels to the Greenway to sell her Red Staggerwing Design creations once or twice a month. “It’s a great way to connect with my customers. I have the opportunity to debut new products and get reactions,” said DeMio. Urban Kitchen Handmade is the brainchild of Jim and Helene Matteson, a husband and wife team producing homemade soaps, candles, and personal care products in their studio in Allston. “We’ve been running the business full time for about five years,” said Jim, pointing to his biggest selling product, the Boston Tea Party soap. 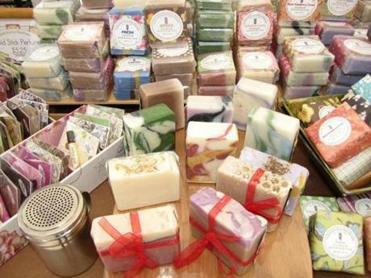 Soaps and candles are among Urban Kitchen Handmade items. The couple attends the market every Saturday, also selling products — all developed by Helene — scented with lavender, grapefruit, lemongrass, oatmeal, honey, and more. “There are lots of markets we could do, located all over the place, but we decided to concentrate on Boston,” said Jim. Worcester-based Meghan Bergstrom presides over Edie & Fin, a line of children’s and baby products (named after her daughter and son) that she designs and makes. You’ll find bibs, booties, onesies, and more crafted from whimsical fabrics. In addition to the usual pink butterflies and hearts (for girls) and blue-brown cars and fish (for boys), Bergstrom uses multicolored fabrics decorated with cassette tapes, mustaches, ants, guitars, and skulls. Her hottest item? The infant bacon bib. Bergstrom attends the market two or three times a month. “I meet people from all over the world — Canada, Ireland, Hong Kong. I like the energy here. It’s fun and laid-back, a family place,” she said. As if on cue, a nearby plaza fountain shoots water in the air to the delight of children who scamper through the wet play area. Necee Regis can be reached at neceeregis@gmail.com and www.necee.com.